Get in and out of the bank and then on with your day using personalized booked deposit slips from CheckAdvantage! Your business' name address and bank information is already printed on the ticket, so there's no need to waste time scribbling it out on a generic deposit slip at the bank! We offer one-part booked deposits, as well as two-part and three-part carbonless deposit slips. The one-part booked deposit slips have room for 27 check entries on the front and 42 more entries on the back. Two-part and three-part carbonless deposit slips contain 30 lines for entries. 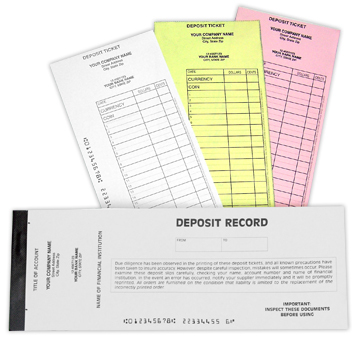 All traditional personalized deposit slips come in sets of 200. Order your booked deposit slips and start saving time and money today! The more you buy the more the price is reduced.